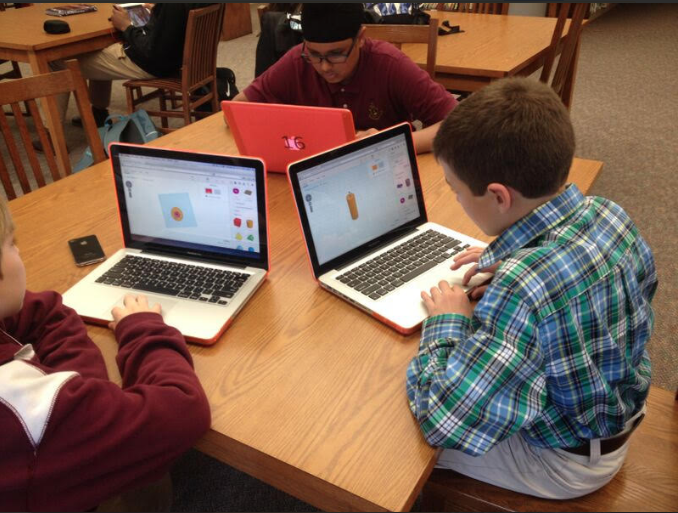 Students at Rutgers Prep in Somerset, NJ, use CAD and collaborate with global partners at iEARN Pakistan as part of Level Up Village’s Global Inventors course. LUV is now in 8 New Jersey Schools. Rutgers Preparatory School was Level Up Village’s first partner in New Jersey, starting with Global Inventors/3D printing in 2014. Students were paired with partner students at iEARN in Karachi, Pakistan, and together, they learned about electricity, the engineering design process, computer assisted design (CAD) and 3D printing. The final project was to design and 3D print solar-powered lights for use by their partner students, who don’t have consistent access to electricity. Rutgers is running the same course for a third time this fall, as well as Global Minecraft City Builders, two levels of Global Video Game Designers and Global Storybook Engineers, Jr.
At the heart of all Level Up Village’s pioneering Global STEAM courses is one-to-one collaboration with Global Partner students in developing countries. Together, students take the same STEAM courses in two locations and collaborate virtually through video message exchange. 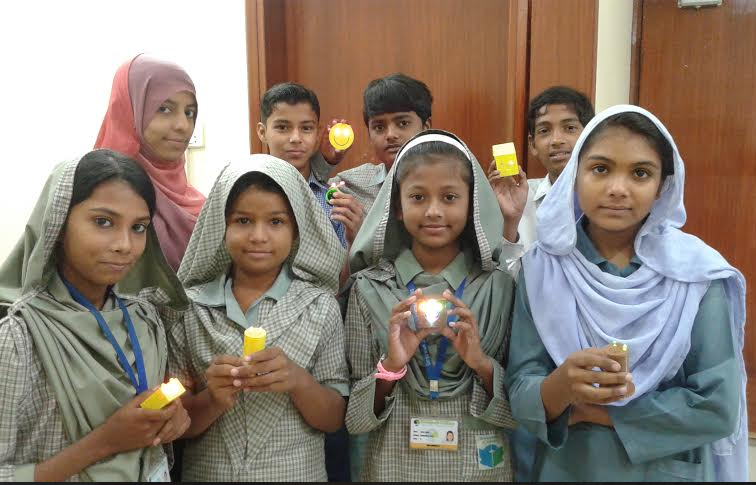 Global Partner students in Pakistan hold up their final, 3D printed solar-powered light source created in collaboration with NJ students. When U.S. schools partner with LUV, they also directly sponsor global STEAM education in developing countries: a portion of the tuition is used to deliver the same course to students at one of LUV’s Global Partner organizations, many of whom are living on less than $2 per day. 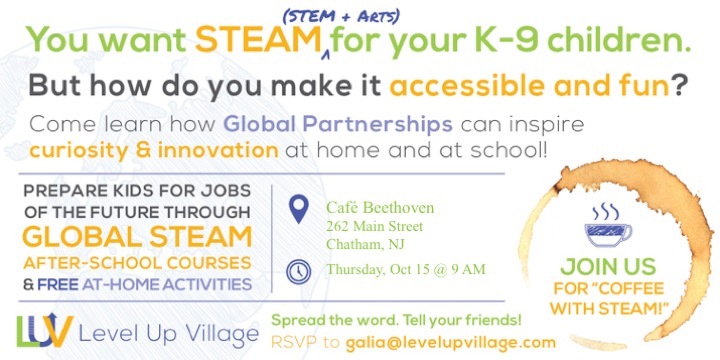 Level Up Village will host an informational coffee on Thursday, Oct. 15 at 9am at Cafe Beethoven in Chatham, New Jersey for PTA parents and educators in Chatham and surrounding towns, who are interested in offering LUV’s global STEAM courses at their schools and community organizations. Coffee participants will receive a variety of STEAM (STEM + Arts) resources they can implement immediately, at home and in their schools.